With local vegetables ripening in my container 'garden' and appearing on every market stall, I'm trying to make the most of them. Among other new season's vegetables I've also bought some great cauliflowers from the market, and am looking for great new recipes. So far, I've tried cauliflower with sage butter & eggs and Ilva's spicy cauliflower with tomatoes. I've roasted cauliflower (wonderful!!) and I've given it an Indian touch in gobi matar (cauliflower & peas with cumin). Here's the simplest way of serving cauliflower - boil, drain, melt, pour & sprinkle kind of dish - very common here in Estonia. But with good young cauliflowers, this is divine (if you like cauliflower, that is). What's your favourite way with cauliflower? And do you like cauliflower at all? I'd love to know! Bring a large pot of water to the boil, season with salt and add cauliflower florets. Boil for 5-10 minutes, until softened, but still al dente. Meanwhile, heat butter in a small saucepan and simmer on a medium heat until it browns a little. Add breadcrumbs, stirring. 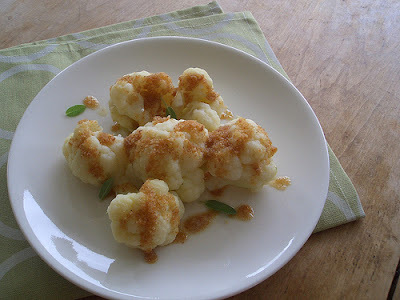 To serve, place cooked cauliflower florets on a plate and drizzle some browned butter with breadcrumbs on top. Garnish with some sage leaves and serve at once. I love the bread crumbs done this way! That looks perfect on the cauliflower! For my entire life, I've been trying to learn to love cauliflower. 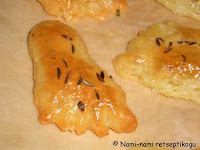 Some of my blog readers have sent their favorite recipes: "oh, you'll love this one!" Sad to say, I haven't yet found the recipe that has won me over. I love cauliflower soup, too, and also baked with cheese. Sounds heavenly. I have a recipe for Cauliflower Fried in Butter that sounds might taste kind of similar to this. Congratulations on the new camera, and guess what, that Casio was the first digital camera I had too! I love cauliflower - and I love cauliflower with browned butter! Haven't added the bread crumbs, though, good idea! Pille, I was practically raised on cauliflower with browned butter and breadcrumbs. It reminds me of childhood and it tastes great! Tanna - it's pretty tasty indeed! Inne - I don't eat shellfish, so cannot try your favourite way, but I'll check out Clotilde's cauliflower gratin! Elsa - see 'valge kaste rohke sidrunimahlaga' kõlab päris ahvatlevalt. Peaks proovima. 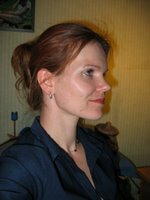 Äkki Sa varsti blogid sellest? Siis oleks kindel, et ma midagi valesti ei tee..
Lydia - sorry to hear that. Maybe this one makes you change your mind? LOL:) Have you tried roasting cauliflower? Apparently lots of cauliflower-haters like that one..
Patricia - yep, both soup and baked with cheese sound delicious! Susan - I'll definitely check it out, thanks! Chili & Vanilla - I've tried roasted cauliflower, but not with bitter cocoa & chilli. Sounds intriguing! Kalyn - that camera thing is funny! Stephen - I'll come and have a look! Clivia - we do something similar here, too. I want something lighter during the summer, but cheese sauce sounds perfect for autumn cauliflower dishes. them a nice crunch - try it! Thanks for listing the various other ways of serving cauliflower - I'd love to try the parmesan and paprika versions! Christine - do try it and let me know how you liked it. I've certainly got a few new tips for using cauliflower, too! Jeanne - I've tried the roasted cauliflower thing couple of times, but added just oil, salt & pepper. Garlic and breadcrumbs sound like a great addition! !